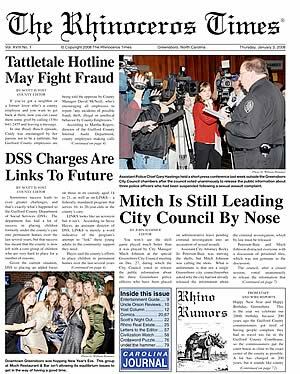 It was first reported this morning that The Rhinoceros Times is going out of business. The issue on the stands right now is the final one that will be printed. So for those not from this are who are wondering: The Rhinoceros Times (or simply The Rhino Times or just "The Rhino") found its origins in a bar called The Rhinoceros Club in downtown Greensboro, North Carolina. 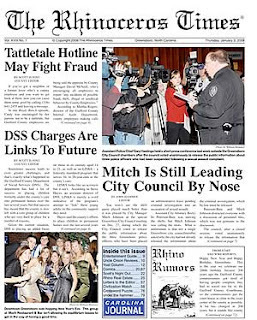 From a one-sheet newsletter started by John Hammer in 1991, The Rhinoceros Times fast found an eager audience among those who hungered for an alternative to the region's "mainstream" media outlets. By the time the presses stopped the average issue of The Rhino boasted 150 pages. Often way more than that. The Rhinoceros Times was a free periodical: you could pick up a copy at many restaurants, grocery stores and other places of business throughout Guilford County and the surrounding area. My favorite place to snag a copy was at the original PieWorks location at Pisgah Church Road and Lawndale Drive. I'd order my pizza and breadsticks and enjoy The Rhino while waiting for the food to arrive. I fast learned not to read it while eating, as the no-holds-barred style of John Hammer and the rapier-like wit of Scott Yost could cause one to choke from laughter. The same held true for Geoff Brooks and his zany cartoons which were always dead-on target. It was a very, very successful weekly news magazine (or "Greensboro's Only Newspaper" as the masthead declared for many years). During its time The Rhino attracted such writing talent as Orson Scott Card and Jerry Bledsoe. The letters to the editor were the liveliest and most passionate that I've ever seen in a local publication. Then there was "The Sound of the Beep": you could call The Rhino's answering machine and leave a message for printing. Some of those were downright kooky. I made a few of them back in my college years (yeah some of the kooky ones too...). This morning John Hammer posted a statement about The Rhino's closing down. The website will continue for the foreseeable future but the print edition that started it all has been shuttered. The fault is primarily the economy, the cost of running a newspaper and competition from the Internet which has hurt everybody in the business. I'm rather surprised that many traditional newspapers in this area are still being published. That The Rhinoceros Times lasted as long as it did is a testament to itself as a product and the people behind it. I sincerely hope that it will continue to have an online presence for many more years to come and that it will keep boasting its fiercely independent spirit. The way the press has become of late, we need The Rhino and other outlets like it more than ever before. Going on twenty-two years is a good solid run. Regardless of what happens next, John and William Hammer and their staff have much to be proud of. And this blogger gladly takes off his hat in salute to a newspaper which broke the ground for many to follow after. It is indeed sad to see the Rhino close. It is also sad to see what has happened to the print media. Although there is an availability of news on the internet, there is nothing like holding the paper in your hands and turning the pages one at a time. It is indeed the end of an era and a journalist like John Hammer doesn't come along often.